Safari - How to retain downloaded zip files? I know I can get (Desktop) Safari to stop unarchiving downloads. I don't mind the files being unarchived. I just don't want the zip archives deleted. Is there a way to do this? (10.8.x). Safari doesn't handle the unzipping itself, it simply opens the zip with the default program, which is the OS X Archive Utility, unless you've changed it. 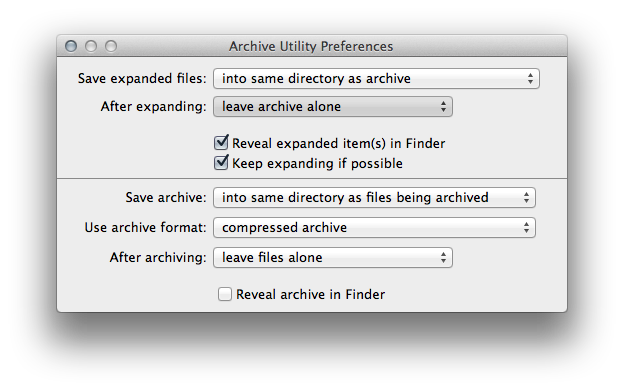 By default, Archive Utility shouldn't delete zip files, but it's possible the preferences got changed. To stop the archives from being deleted, open Archive Utility, located in /System/Library/CoreServices/, then open its preferences. Change the After expanding: setting to leave archive alone. Not the answer you're looking for? Browse other questions tagged safari archive-utility . How do you specify which zip version to compress with?